We’re now in Week 11 of the NFL season. To help prepare, here’s my weekly look at the top starts and sits for fantasy football players in IDP leagues. As we head into Week 11, there are once again six teams on a bye. Ugh. thinning the player pool so harshly as IDP owners attempt to make that playoff push makes lineup decisions that much harder. Throw in the injury factor and the road is even rougher to navigate. Since I’m a glass-half-full type of guy, I will point out that Joey Bosa is scheduled to begin light practicing soon. What can I say. I’m a cockeyed optimist. Here are this week’s picks. Keep in mind that Buffalo, Cleveland, Miami, New England, NY Jets, and San Francisco are on their bye weeks. There are likely some disappointed Addison owners after he put up a goose egg last week following a three-sack performance in Week 9. It’s all good as the matchup with Pittsburgh was a rough one and we can take heart in the fact that Addison did play 65% of the defensive snaps despite dealing with a shoulder issue. The matchup this week is fantasy gold as the Lions offensive line is banged up (T.J. Lang was placed in IR this week) and getting beat up by defensive linemen. In the past three games Detroit has allowed 13 sacks to defensive linemen. This is a bounce back week for Addison. The 23-year-old defensive tackle is having a breakout season and is currently putting up top-10 fantasy production through nine games. Clark has a team-high five sacks (tied with Kyler Fackrell) as well a team leading 32 total quarterback pressures. Clark is getting it done in all facets of the game; he is second on the team in total tackles (40) behind Blake Martinez and has three splash plays. The matchup this week is a favorable one as Seattle struggles with interior pressure. Last week, Aaron Donald and Ndamukong Suh combined for three sacks and 13 total tackles. Since joining the Lions prior to Week 8, Harrison has been a top-10 fantasy defensive lineman, putting up 19 (17 solo) total tackles and a sack. 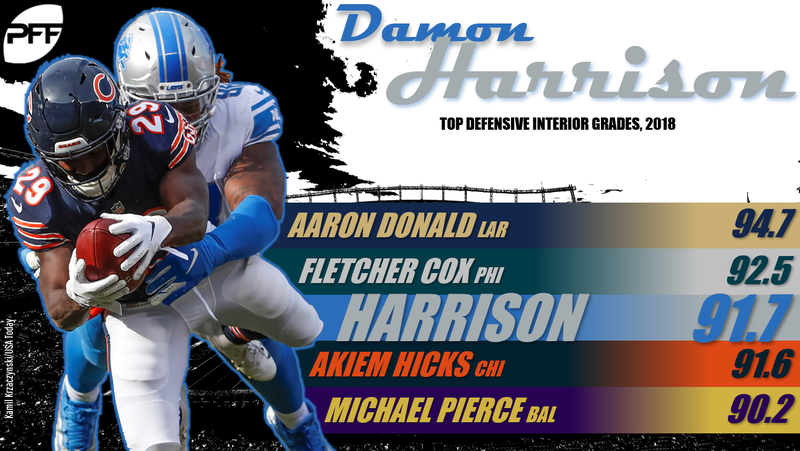 Harrison has been excelling overall in 2018 and is currently grading put as a top-five defensive lineman. Unfortunately, the matchup this week with Carolina is a negative one. The Panthers are allowing an average of just 12 total tackles per game to opposing defensive linemen. Carolina has also been stingy when it comes to sacks and splash plays. Through nine games, they have allowed only 9.5 sacks and three splash plays to the defensive line position. The Saints are allowing the fewest fantasy points to the defensive line position to date in 2018. Through nine games New Orleans has given up just six sacks to the position and allowed three splash plays. Both Graham and Cox are having down seasons, combining for only 52 total tackles and 6.5 sacks. Neither is currently producing top-40 fantasy totals in most balanced scoring formats. This is a matchup to avoid in Week 11 for both Graham and Cox. Over the last three games, the Panthers are allowing the second-most tackles to linebackers at 80, behind only the Buffalo Bills (82). In that time, three linebackers have posted double-digit tackles against Carolina. That bodes well for Davis as he comes off a six-solo-tackle performance in Week 10 against the Bears. Through nine games, Davis leads Detroit in defensive snaps played and has been on the field 97.8% of the time. There is also big-play potential with Davis as he’s been brought on the pass rush 56 times in 2018 and has three sacks. It’s a twofer! The return of Leonard Fournette saw the Jaguars rush the ball 34 times last week, which tied their season-high set back in Week 4. The run-heavy attack led to the duo of Darius Leonard and Anthony Walker combining for 18 total tackles. Both Bostic and Williams finished with LB2 numbers last week and are poised to repeat the feat in Week 11. The tackle opportunities will be there, and both bring big-play potential as well. Blake Bortles can be a turnover machine on any given week and linebackers have accounted for nine splash plays as well as eight sacks against the Jaguars. Short-and-sweet special of the week. The Falcons activated Jones (foot) from IR this week but it’s far from a given he will play this week. If he does, I advise a wait-and-see approach as Jones will likely be eased back into action. This is too tough of a matchup to roll with Kendricks despite the fact he is coming off his highest tackle total (nine) back in Week 9 against Detroit. The Bears have really held linebackers in check over their last three games. Chicago is allowing an average of only 13.3 tackles per game to linebackers in that time along with two sacks and a forced fumble. Splash plays are not Kendricks’ strong suit as he’s produced just two in nine games. There are a couple of factors in play leading to a sit designation for this duo. First of all, it’s still uncertain if Cunningham (knee) will return to the field following the bye week and if so, how many snaps he’ll be given. Secondly, the Redskins have been a brutal matchup for linebackers over their last five games. In that time linebackers are averaging just 17 tackles per game against Washington with one sack and zero big plays. We ride the hot hand with the rookie Bates this week as he has posted double-digit tackles in three of the past four games. It’s worth noting that in those four games Bates lined up in the box or on the defensive line only 54 times. The youngster is making tackles all over the field and returned an interception for a touchdown in Week 10. When these teams met back in Week 2 Bates posted his first career interception. Let’s show some love to the cornerback position. Over the past three weeks, Amukamara has been among the top-scoring defensive backs from a fantasy perspective and is coming off a monster performance last week. Against the Lions Amukamara tallied eight solo tackles with an interception and two forced fumbles. Over the past three games Amukamara has put up 15 total tackles which is just two fewer than the 17 total he’s put up in the other five games he has played. Kirk Cousins can be a bit fast and loose with the ball, so Amukamara is in for another big game. We have a “from the penthouse to the outhouse” situation after Swearinger bombed as a start selection last week. It appears the arrival of Ha Ha Clinton-Dix has submarined Swearinger’s fantasy value. In the two games Clinton-Dix has played for Washington, he has posted 15 total tackles and recovered a fumble. In those same two games, Swearinger has two total tackles and two passes defended. The Texans have been a negative matchup for defensive backs over the past four games and it’s time to move on from Swearinger. It was a positive sign to see Boston play 56 of 59 defensive snaps last week after missing time with shoulder and neck issues. The 3/1/4 stat line Boston produced was not quite as positive and he played a season low four snaps in the box or on the defensive line. That role renders Boston as more of a splash-play option and this week’s matchup does not bode well. In the last four games the Raiders have allowed just a single forced fumble to the defensive back position.